A few months ago we released the Endeavor J-Series fiber laser marking system and now we announce the release of the Endeavor RETRO. The Endeavor RETRO is designed to be a replacement system for any existing flash lamp, diode pump, CO2, or other existing laser system. TJS Laser offers three different options, the first being the Endeavor J-Series a turn-key, Class 1 enclosed automated marking system discussed here. In the future, we will introduce a desktop version for small runs and job shop requirements. With its small footprint and flexible interface, RETRO can be mounted on just about any platform including existing automation, conveyors and other part processing infra-structure. All RETRO systems are air-cooled and operate on 120VAC making integration simple and operation very cost effective. All Endeavor RETRO systems are proudly manufactured and assembled in the USA. We are so confident in our design and reliability that we are the only company offering a 3-Year warranty on our fiber laser! 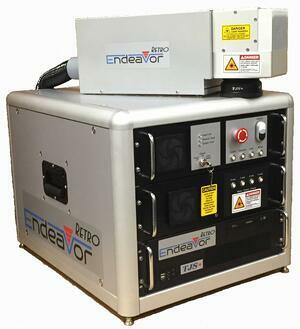 Contact us for more information about the Endeavor RETRO Endeavor fiber laser marking system. This post was published on December 9, 2015 and updated on December 11, 2015.